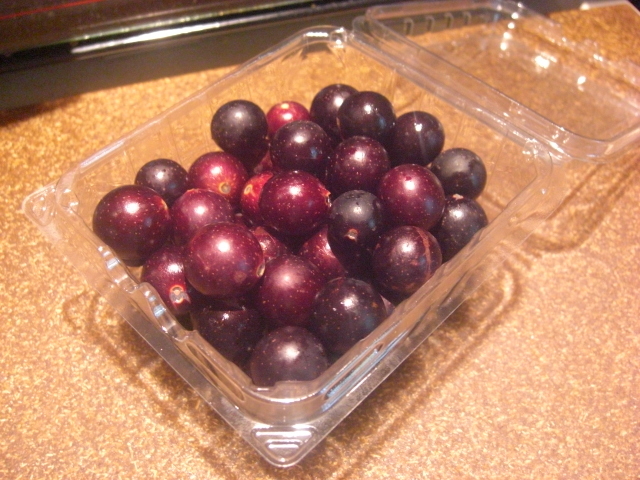 I ground up these muscadines in the food processor and cooked them down with some water, strained the skins and seeds out , and then added some pectin to the cooled mixture. It didn’t really gel, but that’s okay. 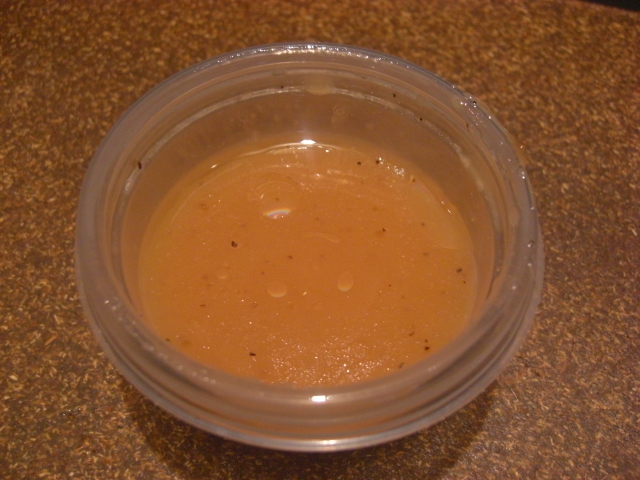 It’s destiny was to be muscadine vinaigrette. That’s muscadine stuff, olive oil, salt, and pepper. 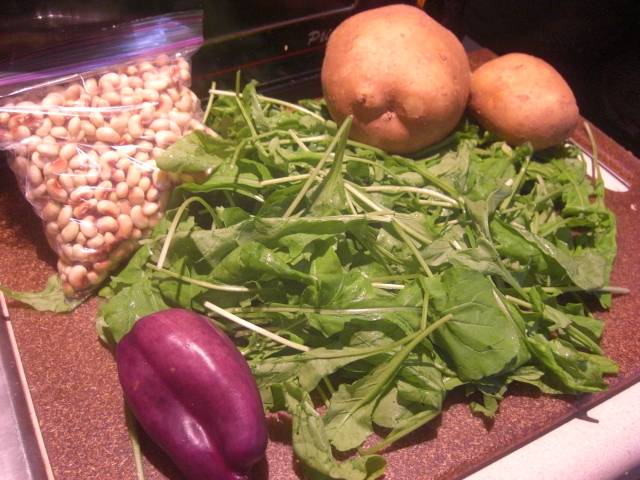 It makes a nice addition to a handful of arugula. You can see some here on this all local supper plate. 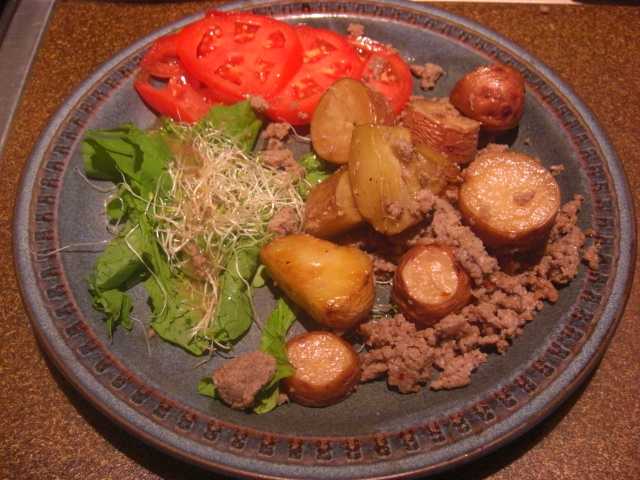 arugula and sprouts (with muscadine vinaigrette), sliced tomatoes, and roasted potatoes with sausage. 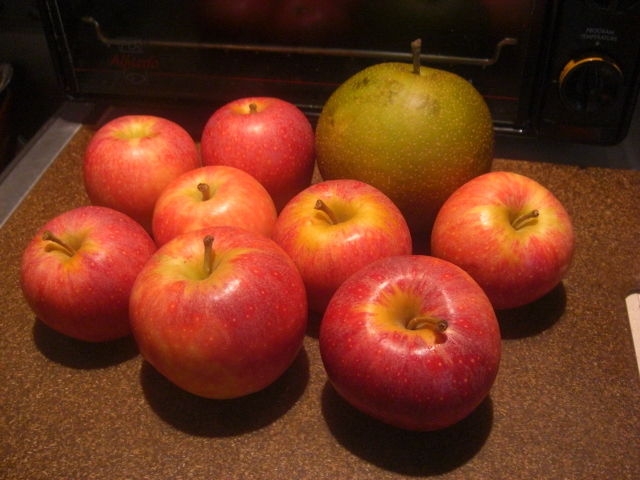 Now back to the produce show. The field peas and arugula disappeared pretty fast. I gave the pepper away. I believe I baked these potatoes one day and then mashed them up and nuked them with butter and cheese some other day for a quick late supper. 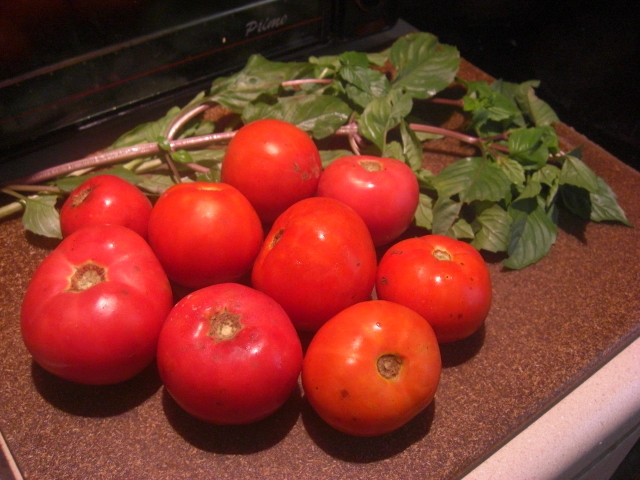 I saved a couple of tomatoes for slicing and the rest I cooked down. 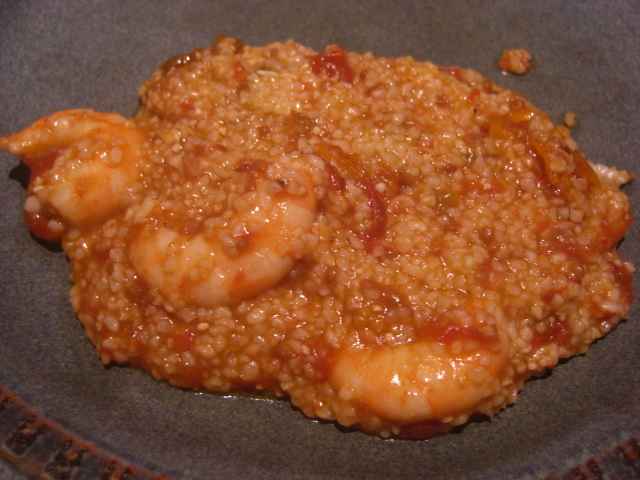 Then I mixed in some mostly cooked local corn grits and some local-ish thawed shrimp. It made for a nice supper. Please imagine freshly chopped basil artfully (artlessly?) scattered on top. The yogurt was a nice surprise. 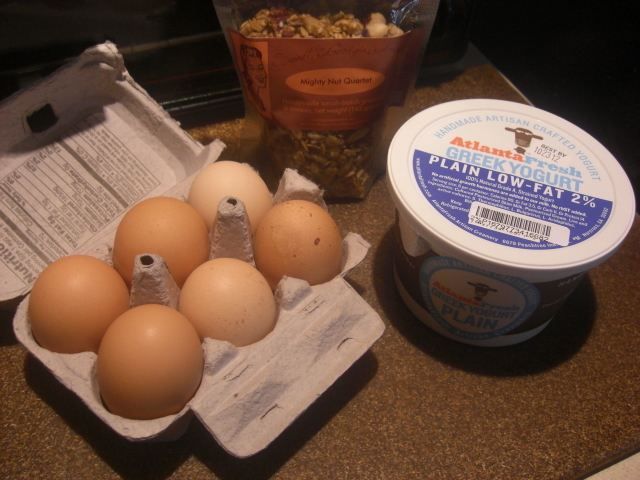 One of my favorite treats is Annie’s mac and cheese in a box made with yogurt instead of butter or milk. It’s great and fast comfort food. Goat’s milk is delicious, and I love buying local milk. However, it is expensive and, with two guys in the house who consume mass quantities of cereal in the morning, I’m not quite ready to develop a habit. 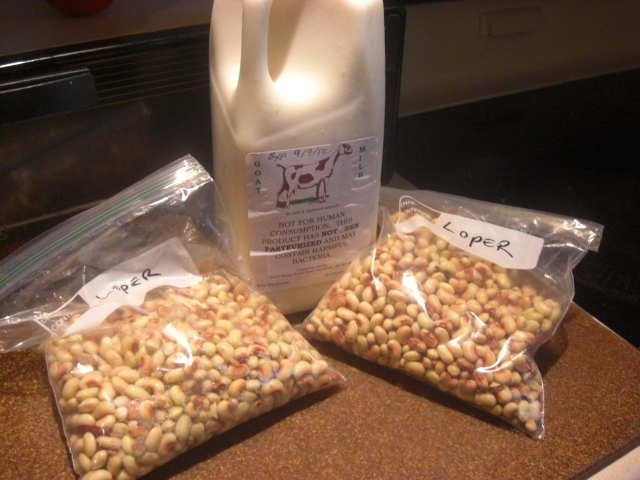 Earlier this year, we learned that frozen field peas cook up as nicely as fresh ones. So we got a few extra bags to toss in the freezer.